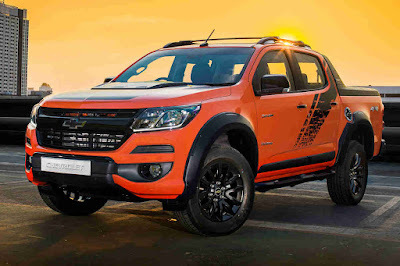 All variants of the Colorado, including the High Country Storm come with free PMS for the first 2 years or 40,000 kilometers of ownership for all units purchased from now until the May 31, 2019. This offer is on top of Chevrolet’s “Beyond the Ordinary” promo which sees the following all-in low downpayment options until April 30, 2019. Every purchase of a Chevrolet vehicle entitles owners to a free Chevrolet-Caltex SavePlus Card, providing them with fuel savings for their new vehicle. The Chevrolet Trailblazer and Chevrolet Colorado come with a special 5-year warranty coverage: 3-year bumper to bumper warranty plus a 2-year warranty on the Powertrain or 100,000 kilometers, whichever comes first. The Chevrolet Sail, Chevrolet Spark, and Chevrolet Trax come with a 5-year warranty program, which offers coverage of five years or 100,000 kms, whichever comes first. The Chevrolet Beyond the Ordinary Promo includes free comprehensive insurance, 3-year LTO registration, and Chattel Mortgage fees. Qualification for ownership packages is subject to bank approval. The promo is in partnership with PNB, BPI, Security Bank, BDO, Maybank, and China Bank Savings.